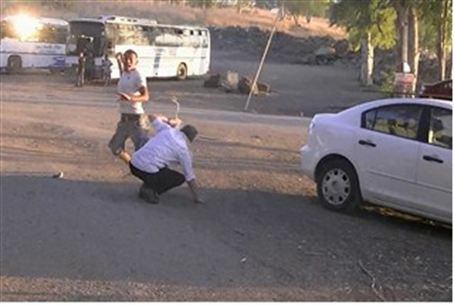 Yeshiva students and their rabbi attacked by Arab staff at the Jordan River Rafting site. Site denied incident, then accused students of attacking. Students of the Yeshivat Bnei Tzvi in Beit El and their rabbi were attacked on Thursday by Arab workers at the Jordan River Rafting site. Arutz Sheva’s Hebrew website has learned that as the students made their way on foot to their bus after a day of fun activities on the site, a Bedouin driving a tractor drove straight toward them at high speed, endangering their lives. When the surprised students shouted at the driver, he got off the tractor and threatened them. Meanwhile, some of the driver’s friends arrived on the scene and one of them hit a student in the face, causing the shocked student to spray tear gas carried for protection in the attacker’s face. The incident escalated and at its climax, one of the Bedouin workers ran after the rabbi while holding a stone and then grabbed him and knocked him to the ground. The attacker only put the stone down and left the rabbi alone because the students raised a commotion. Five students were treated at the local infirmary for light injuries. Some of the students managed to video tape the entire incident and the group has filed a complaint with the police. Jordan River Rafting at first denied that the incident had taken place, but later presented a different version of what had happened. Thursday’s incident follows two other incidents earlier this week involving Arabs attacking Jews. None of the violent events occurred in Judea and Samaria. On Monday, a rampaging Arab assailant beat a 40-year-old man with a hammer and sprayed tear gas at a cab driver in Be'er Sheva. One of the victims was moderately injured and the other was lightly injured. Both were hospitalized at Soroka Medical Center. On Sunday, a 27-year-old Jewish man was yanked out of his car and beaten by an Arab mob in a Jerusalem neighborhood, after making a wrong turn and entering the eastern Jerusalem neighborhood of Issawiya. A young boy yelled "Jew, Jew" upon seeing him, and a mob gathered immediately. The Mukhtar of Issawiya and several Arabs who live in the same neighborhood rescued the Jew, police said, and protected him in the Mukhtar's home, all the while being threatened by the frenzied mob, until an Israel Police patrol car and Border Police officers arrived.